A beautiful thing, risking every penny you have to develop a massively valuable trading signal and getting to witness it pump out predictions brilliantly. 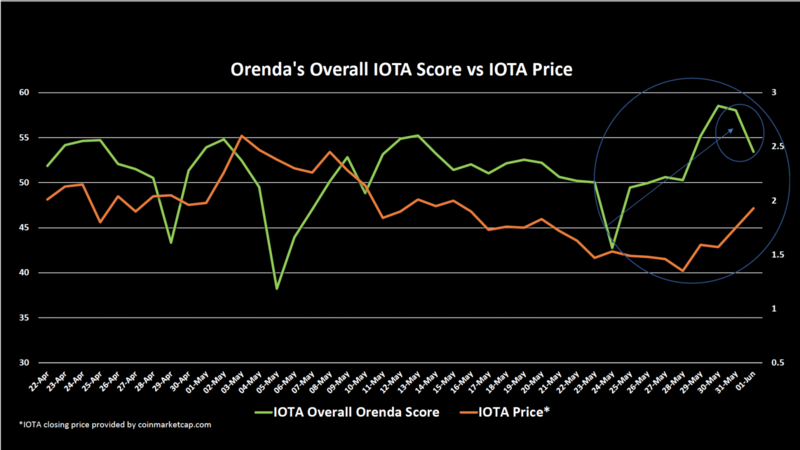 It was May 24th when the Orenda team observed the cryptocurrency coin IOTA (MIOTA) taking a sudden upswing in our proprietary index, even though the coin’s price was still trending down. Our team knew without hesitation what was going to happen next, the coin’s price was going to reverse and trend up. For four days we watched with delight as the Orenda index continued to climb. It wasn’t until May 28th that the market finally reacted and IOTA galloped past other coins’ average daily gains. The pride in our tiny office was palpable that day. It wasn’t the first time we predicted a long or short trend, it happens a lot, but it was the first time IOTA made our day. And we were still impressed with ourselves on May 30th when our index predicted a price correction, which happened on June 1st. The tricky part is that we didn’t trade on the data. We aren’t traders by profession and instead have been focusing all of our energy on fine-tuning this predictive powerhouse. As it turns out, it was a smart investment on our part. Orenda continuously demonstrates its power to unlock patterns in social media sentiment using AI and a special area of social science. And, Orenda’s predictive power isn’t confined to only crypto. We see results in several verticals that society finds interesting, such as ESG (Environmental Social Governance) Investing. After the IOTA success, we decided it’s time to enter the financial market in a few new directions. First, we’re going to sell our predictions in crypto. The next step involves a new partner, so we started to make new friends to find the perfect fit.